As part of his persecution, Emperor Constantine V tried to eliminate the cult of St. Euphemia, by throwing her relics into the sea. This gesture of the second iconoclast emperor had not much to do with his iconoclastic fury as was attributed by sources; rather it was purely a political gesture. 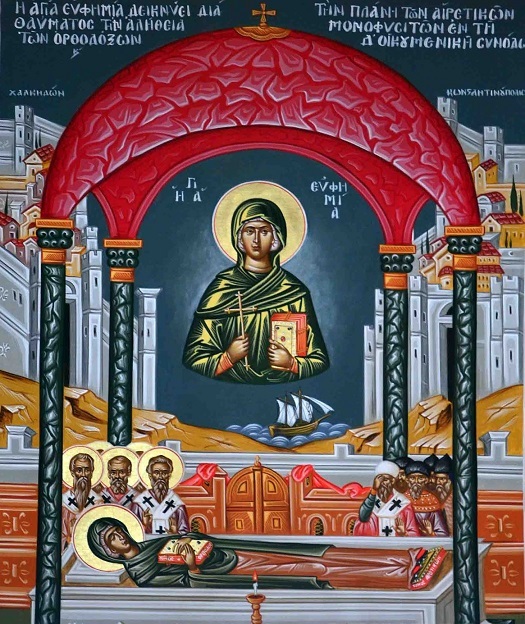 St. Euphemia, who was sheltered at the basilica in Chalcedon during the Fourth Ecumenical Synod in 451, symbolized the Canons of this Synod, which stipulated the ecumenical Orthodoxy between the popes and the Byzantine emperors. Prior to the eighth century, three popes (Gelasius, Donus, Sergius I) were in conflict with the emperors Anastasios I, Constans II and Justinian II respectively, and they devoted basilicas in honor of St. Euphemia, in this way insinuating these emperors had not respected the Canons of Chalcedon. In the eighth century, when the papacy rejected Byzantine sovereignty, the foundations of the papal state were laid. 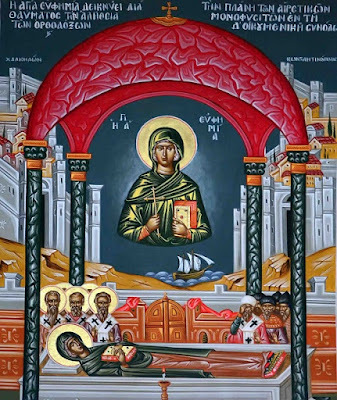 St. Euphemia lost her previous importance and was replaced, so to speak, on the papal side by St. Sylvestor (Donation of Constatine), who represented the new reality: the independence of Western Byzantine sovereignty. Meanwhile, by destroying the pontifical symbolism of St. Euphemia, Constantine V manifested his intention to submit the universal higher clergy to the Byzantine imperial institution. The complete article can be found here (Greek).